When is a composer not a composer? An interesting question, but perhaps it should be, “When is a composer more than the sum of their parts?” Perhaps you could say that I’ve been having a bit of an identity crises lately. For the longest time there has never been any question when it came to identifying myself: I have always said that I’m a composer (first), then a writer. Years ago, and I mean several years – as in twenty something years ago – I also called myself a classical guitarist, but I allowed that to fall by the wayside and I stopped practising, and even stopped playing guitar altogether for quite some time, though I still played the bass on occasion, but not nearly to the same degree as the eight hour practice sessions that I had put in when I was in college. My first tattoo: the musical themes spell out the names of two composers, BACH, and DSCH. Bach is obvious, DSCH is Dmitri Shostakovich, and it is a motto theme he used in several of his works, including his Piano Trio, Op. 67. The Black Bird is my name, in German (Amsel), and the fountain pen is simply because I enjoy composing in ink, with fountain pens (rather old fashioned, yes, but that’s me). The Maple Leaf is just a little Canadian feature, to close the design. “Maestoso e Serioso” is an indication that summarizes how I take my art: Majestically and Seriously … but there’s always room for fun. But, if I learned anything, it should have been that nothing remains the same, and that time has a way of changing everything. Especially people. I’m not the type of person to say things like, “I’m never going to do … x, or y,” for the simple reason that I’ve seen myself do several things that I had never thought I would do … like getting tattoos … I have some now, and I never thought I would have ever done that, until I found myself thinking about an idea that I really liked, and then found myself designing it, and then one day I was sitting inside a tattoo parlour, sitting through the six hours it took to get it inked permanently into my right forearm … and I couldn’t be happier with the results. After that I sat through another three eight hour sessions to get my left sleeve inked … but the point is not that I have the ink, the point is that at one point, several years ago, had you asked me, it would have been the last thing that I could have seen myself getting done. Now, piercing … that’s a definite no. Seriously … I can’t even think of how people … never mind; now that I think about it, the more I say the more I realize I probably do want something pierced … but … never mind. That’s not the point though, life is about evolution, about growth, it’s about change, and this year has been about a great deal of that for me. Take the guitar, for example (as opposed to the tattoos). 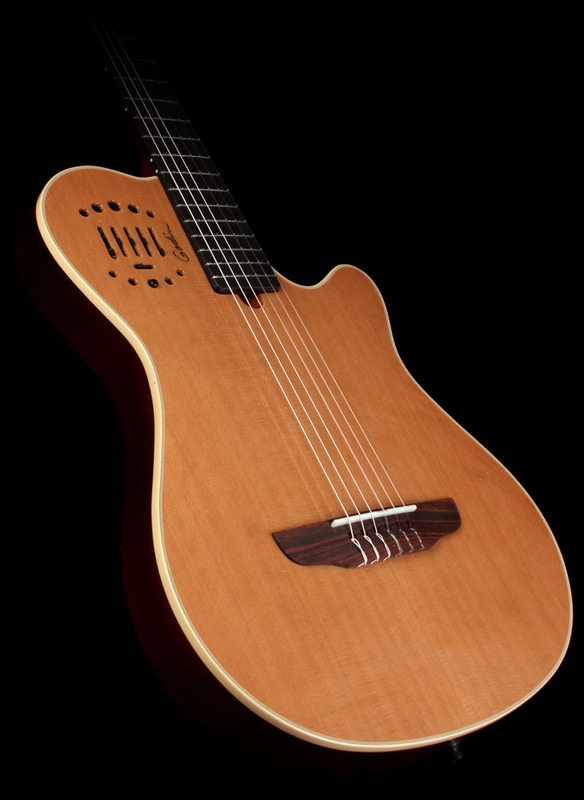 I hadn’t played classical guitar in decades. Literally: I had not played serious classical music since the 1990s. My desire to start again stemmed, in part, from my use of social media and my contact with several musician friends who posted, quite often, about the enjoyment they derived from playing their musical instruments. In the meantime, I was writing music, but that didn’t seem to be the same, and I wanted more. I’ve always enjoyed improvising on other instruments, including bass (electric), and some transverse flutes that are “fife-like”, but for some reason I had left the guitar in the ditches. There really isn’t much of a mystery as to why I stopped playing, and why I was reluctant to begin again: it all boils down to one word, a short, four-letter word. Pain. Chronic pain made playing the guitar something that was not only progressively more difficult, it became virtually impossible. Over time I discovered that the source of the pain was a chronic condition called Fibromyalgia, which is a condition shared by many people, and for which there are a number of treatments, all of which have failed miserably with me. The most common treatment, Cymbalta, nearly resulted in my death from something called Serotonin Syndrome, as it interacted with my medications for mood stabilization for bipolar affective disorder. Oh well … the good news is that your pain is a bit better, sir … the bad news is, you’re going to die. Sorry. Fortunately, my family doctor is exceptionally good and noticed my erratic behaviour (even for me) in her office and immediately put two and two together, and (as someone close to me said), proclaimed, “It’s the Cymbalta, stupid!” … though she left out the ‘stupid’ part. Oh well … better luck next time. Then, one day several months ago, I saw her, alone in a music store. She was just standing there, waiting to be found, every curve of her body calling out to me from the corner she was leaning up against. A true thing of beauty, whispering to me, seducing me … as soon as I touched her and heard her sweet voice, I knew that I was hooked: I’d found my love. 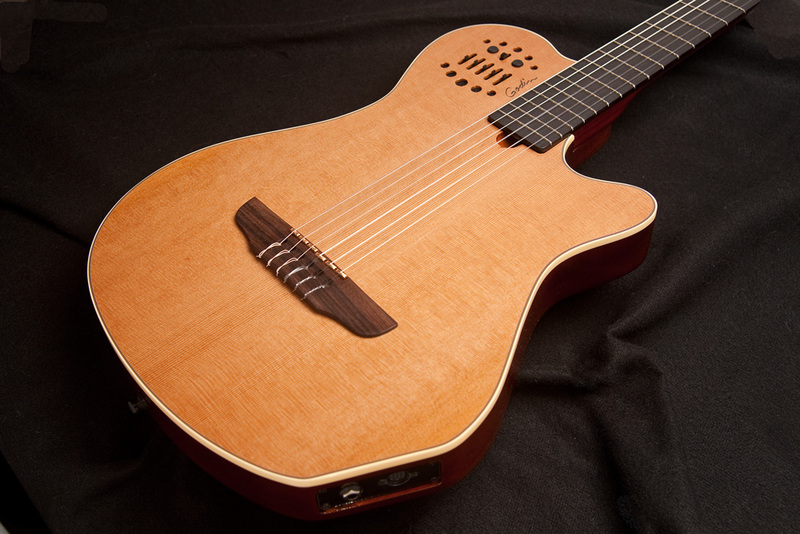 Her name is Godin – she is a Grand Concert Multitach, and She’s a beauty. On top of that, she sounds absolutely amazing, even without the assistance of an amplifier, which I’ve only used for the times that I’ve performed. Otherwise, I play her “au natural”. Even more importantly, the fact that I have fibromyalgia is not so much an issue with her, not as much as my last instrument was as I can play her while wearing a strap, which means it is not necessary for me to sit in that horrible classical guitar position (suddenly, the reasons why I stopped playing so many years ago flood back … and it hurts, just to remember) … and I am liberated. All of a sudden, after 20 years of not playing, I’m playing concert repertoire again – some stuff that I played before, in college and university, but new material as well … and I’ve written almost ten pieces – big major pieces – for the guitar in a relatively short period of time – all because I bought this guitar. But that’s not the whole story. While that was going on there was something else growing in my brain, getting larger every day, taking on a life of its own. I had been working on the outline for a novel for quite a while, but hadn’t taken the time to go beyond that point for the simple reason that my composing was always at the forefront of my priorities. Around the beginning of December it finally came to the point where I just couldn’t deny the creative imperative any longer: I had to take to time to write, to get it out of my system, for better or worse. If I didn’t take the opportunity at this juncture I risked losing something greater than I realized: an opportunity at expressing myself artistically; losing that is a greater tragedy for an artist than anything else they may lose. Thus far I’ve written about 70,000 words, and there’s plenty to come, which brings me back to my opening question … when is a composer not a composer …? When I began writing the novel in earnest I was surprised to discover that my creative energies seemed entirely satisfied by the writing process: I did not even feel the slightest need to compose, which was good because I was exhausted after typing all day. Writing is not the same as typing, it is far more difficult; you are concentrating, constantly running through the ideas in your head, and then, typing them once you’ve straightened them out to your liking … and then you rework them for several minutes, once it has been written down, or when you happen to scroll past it while looking for something in the manuscript. As it is, my manuscript is now over one hundred pages in length at present, so when I scroll through and something catches my eye it is quite easy to find myself editing something I’ve already looked at for an hour or so. But I digress … often. After about two weeks of writing I came across an article in one of the Facebook groups I read, about a minimalist piece by American composer Terry Riley. The piece is called In C and was composed for a minimum of 35 instruments, and is based on a series of cells that are played, repeatedly, by the performers, until they decide to move onto the next grouping. It isn’t a style of composition that I was unfamiliar with as I’d played a study for guitar in a similar fashion by Cuban composer Leo Brouwer, but it got me thinking about a piece of my own, and there were suddenly themes going through my head, and they had to be written down. Over the course of the next few evenings I wrote what has become a work called Simple Gifts – which is now almost complete – and will exist in a number of versions, at least three. The first version will be for four guitars, the second version for string quartet, and the third version for four wind instruments – three treble and one bass, such as flute, oboe, clarinet, and bassoon. The piece will never sound the same way twice, and could be anywhere from ten to twenty-five or thirty-five minutes long – or even longer – depending on how the performers are feeling, and the choices they make as they play the piece. It is, in essence, a form of aleatoric or stochastic music: music left up to chance, without having to roll the dice at the time of the performance. When the performers have their score they will decide (based on guidance from the composer) which cells to play first, and where to go from there, but there will be great leeway as to where to go from there: certain “structural points” will be emphasized so that the players “meet up” at particular places – there will be meeting points where a player will wait until the other musicians “catch up” to that point, and then they will depart from that “departure point” to the next point, again freely moving through the cells. Thus far there are over 100 cells, either of 4 or 8 beat durations, with several more to come. Several will be dedicated to the bass instrument, while the others will be put into an order that helps “guide” the piece as I’m hearing it … without being too dogmatic … it is supposed to sound somewhat improvised, after all. Meanwhile, most of my days begin with a few hours of practising … which serves to stimulate my imagination more than anything I could ever do. As I play the music of other centuries and eras, and improvise on my own themes and ideas, I can see the world of my novel come to life before my eyes, my character’s souls unfold before me, and the roads that they must take become as clear as Crystal Lake, the lake upon which Deidralla, the capital city of Deidrach, exists. It was the first land to be settled in the Remnant after the Great Darkness ended … but I digress … again. On the days that my pain is too bad for me to practice first thing in the morning I will usually play later in the day, when things have settled down enough for my hands to move across the fingerboard of the instrument. Guitar is not an instrument that is conducive to playing in pain, but when you start you can push the pain aside enough while you’re playing, if your concentration level is at a high enough level. This is something that I have been able to do while composing and writing, and also while playing: but it takes a toll. When you stop the pain attacks you with a vengeance, and then you’ve had it for a while. You have no choice but to give in, at least until you regain your equilibrium. So, in the span of one year I suppose things have come full-circle for me. I’ve gone from being just a composer to, once again, being a composer, writer, and even a classical guitarist again. Since I started playing again, back in April, I’ve already had two performances (playing background music … the bane of the classical guitarist … but … it pays, so why not), so I guess I’m not doing too badly. As for the novel, given the rate I’ve been going I can honestly say I have absolutely no idea as to how long it will take for me to finish. At this point I’m not even sure if it is going to be confined to one volume or if it will take more than that (read: three … remember, I’m at 70K at this point … my hero has not even been born yet … right). So, it could be a long LONG haul yet – but that’s fine … I hope. If you can keep a secret: one of the reasons I chose Fantasy as the genre for my novel was because it allows, more than any other genre, authors to go further in expressing themselves than would be possible in another genre (save, perhaps, for the Action/Adventure Novel). Suffice it to say, I shall try and bring some updates here in future posts – as well as some tantalizing … snippets? Please be patient – and stay tuned for more. For more updates follow me on Twitter @CrazyComposer for updates regarding the novel under #TheRemnant and #AmWriting and generally entertaining Tweets (if I do say so myself).